IDW is proud to introduce a new line of graphic novels that adapt some of the best-loved books of all-time. 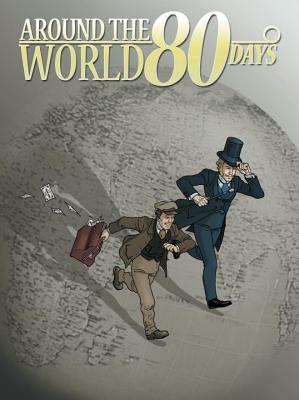 Next in the line is Jules Verne's Around the World in 80 Days. Travel around the globe in eighty days This is the crazy bet that the English gentleman Phileas Fogg accepts from the members of the eminent London Reform Club in 1872. He drags his manservant Passepartout from steamboat to railway in a reckless race against time. The whole English police force -- convinced that he is the fabulous thief who has just robbed the Bank of England -- is also dragged into the race, with Detective Fix at their head. It is a wonderful adventure where their paths cross that of a beautiful Indian woman destined for the funeral pyre, and where bridges collapse and ships burn... but will the gentleman's extravagant expenditure be enough to get them back in time for the day and hour they are due to arrive?